I sit here with the Bennington brochure in my hands beginning to write this review and I’m almost taken back at this thing. It’s 64 pages, hard spine bound, thick paper stock with glossy pictures and soft textures on the cover. Inside, breathtaking images that really showcase boating, as well as offering details on their many models and options. And that’s really the point I’m trying to make here. Five years ago this kind of investment into a pontoon brochure would have been laughed at, but now it’s a must, showing their utter dominance of the industry. As pontoons get bigger, faster and fancier, they also get pricier, which can scare away a majority of the market so it was refreshing to see Bennington flirt a fine line with their SX 21 Cruise, the boat we had a chance to review with the all new Yamaha VF 150, V-Max SHO. If we look at the tale of the tape the SX 21 has an overall length of 22 feet. It sits on an 8’ 6” beam and this one specifically had the Sport Performance System or SPS - a $5000 upgrade - that brings the hull weight to a tickle under 2000 lbs. With fluids the VF150 weighs around 500 lbs so you still have a very manageable package should trailering be in your future. The “Cruise” in the SX 21’s name refers to the floor plan. 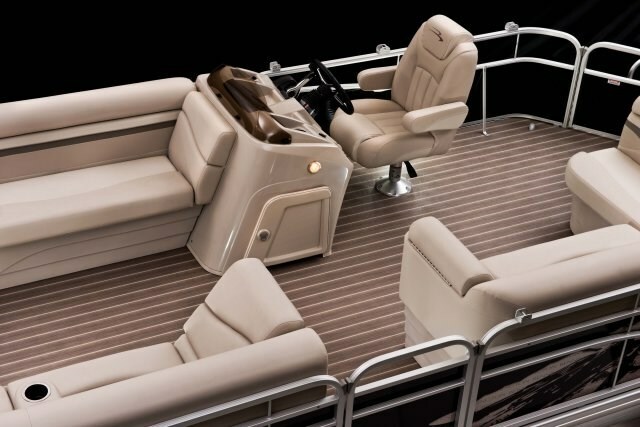 This means you get facing wrap seating in the bow, that have forward facing loungers and L grouping in the stern along with a sun pad directly behind that where you can get the optional change area as well. If I’m being honest, I would have liked to see that as a standard option. On that note though, let me back track a bit and tell you about the S and SX lines from Bennington. They’re meant to be the bare bones segment of the line up, very simple, understated and affordable - making them very popular with Canadians - in fact the SX 21 is the best selling Bennington in Canada. So when I say I would like to see the change enclosure as a standard feature you can see how that starts to get away from the essence of the line, I’m not saying, I’m just saying. Sticking with that, our test boat was optioned out perfectly in my mind. 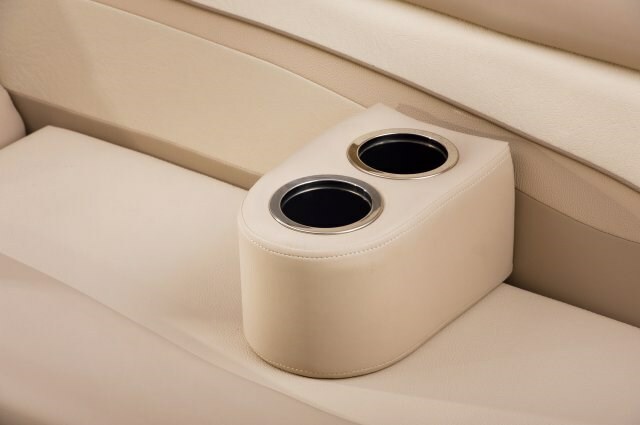 The two stand out options were the vinyl flooring and the high back, reclining helm chair. These two in my mind are an absolute must. Having been at many a boat show, talking to many customers the consensus is simple - carpet is dead. Vinyl is in. The high back helm chair that reclines means the captain is going to be comfy and relaxed and he might be a little more inclined to take his guests for longer rides leading me to my next point. A cost effective package would be the standard twin log package with a 60 hp motor. This package would top out at about 25 mph with two people on board. Add more people and your speed goes down. 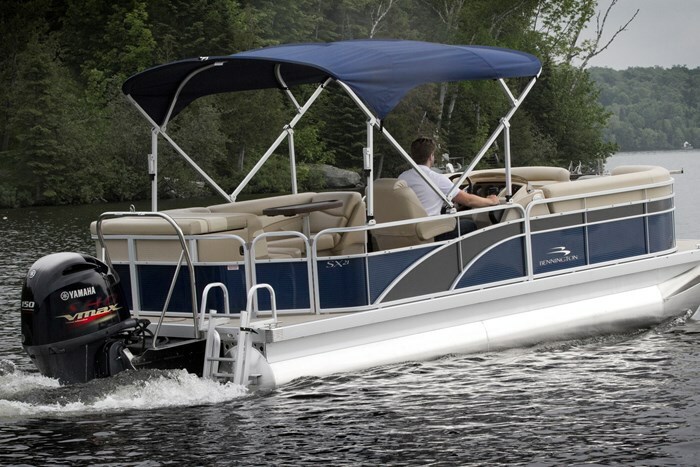 With this, you’re just another pontoon. 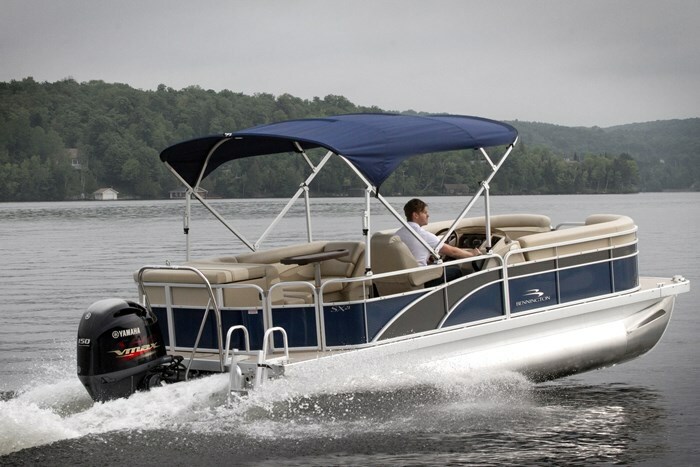 But by adding the SPS package and a 150hp engine, you now have sport boat performance with pontoon boat comfort. With three people on board we topped the SX 21 out at 41mph at wide open throttle and the VF150’s rev limit of 6000rpm. It cruised in the mid 30’s without hesitating and you can slow it down to an economical cruise of 24 mph at 4000rpm and just sit back and relax. I was most impressed by the handling of this package. The SPS package turned the sharpest that I have seen a 22 foot pontoon turn when I put it into an aggressive full lock turn. Part of that was also the power of the VF150 to be able to push the back end around. This is fun and all but think about it, it’s also much safer. Pontoons are not known as the most nimble boats on the water so being able to avoid an obstacle or surprise is a great peace of mind. And I think peace of mind really sums this boat up. It’s an economical package. 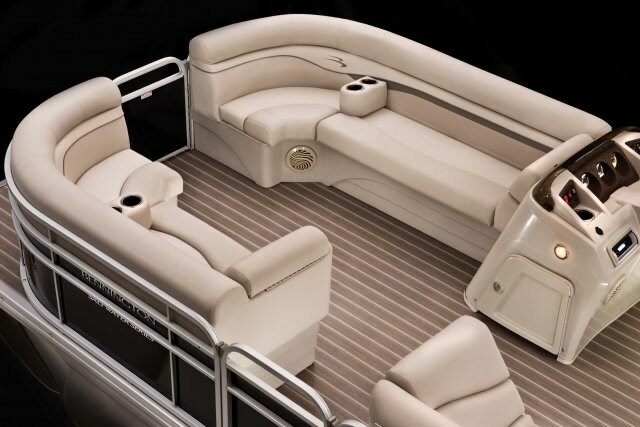 With a tested price of just over $42,000 it puts you in a competitive price with boats that give you much less and it’s backed by Bennington’s construction history. You get peace of mind knowing you spent your money on a great boat!